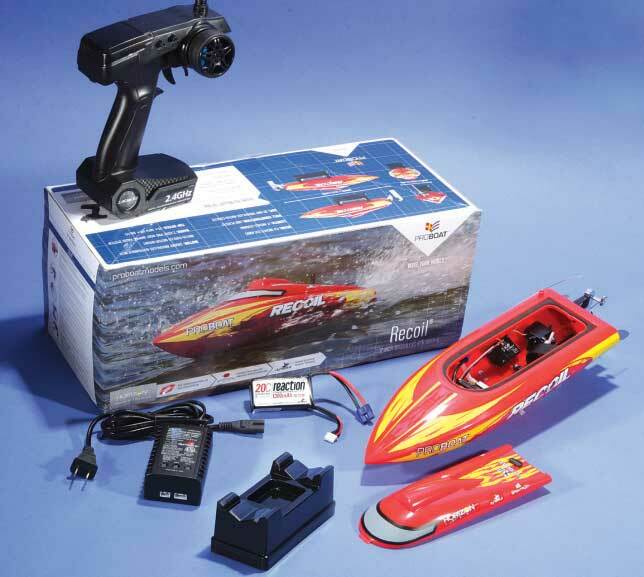 Home » Reviews » Mini Boat Guide: Small Watercraft, BIG FUN! As the weather gets warmer people leave the house for the pool, beach, a pond, lake, river or stream to cool off. With so many manufacturers making quality boats that are low maintenance and easy to use all you need to do is charge up a few batteries, toss one in your car and be ready to make(small) waves. If the idea of having some fun on the water has you interested read on as I’ve compiled a short list of small boats, easy on the wallet, that are sure to please. 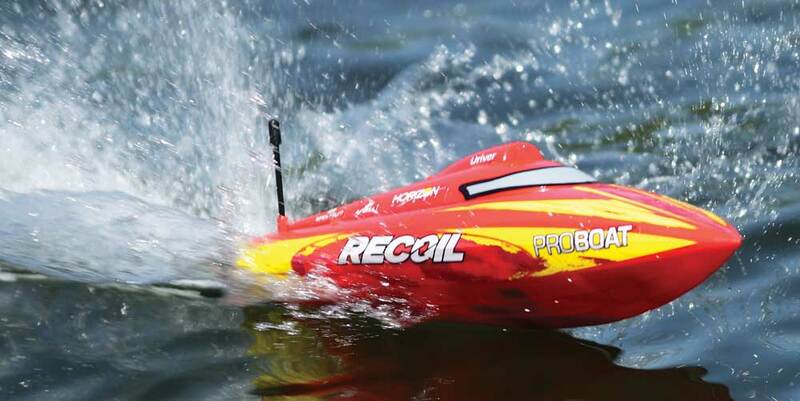 Let me start off with the Recoil 17” from Pro Boat. Weighing in at just over a pound, this little deep-V is fast, VERY fast. If you are thinking of getting this for your small backyard pool think again as this little speed demon utilizes a water cooled 2950Kv outrunner brushless marine to get the 3-blade prop spinning. Super smooth throttle response is provided by a 30-amp Dynamite ESC that is also water cooled and has a blue heatsink mounted on top. While the motor and ESC are impressive on their own, the included 3S, 11/1V 20C LiPo battery pack puts the Recoil 17” over the top and helps it reach speeds of 25mph. Being an RTR, it also comes with a 2.4GHz transmitter, 4-channel receiver, 2-amp charger for the 1300mAh LiPo battery pack and even a boat stand. 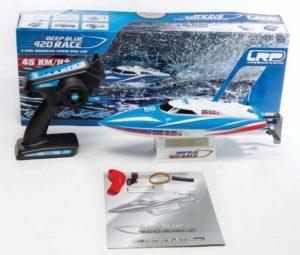 LRP makes more than high end speed controls, chargers and electronics, they make boats, too, and their Deep Blue 420 Race Boat is just as good as their world championship winning electronics. It has a selfrighting ABS plastic deep-V style hull so should it flip far from shore it can easily be righted simply by applying the throttle. On the back of the hull there is an aluminum alloy rudder that is offset right and there are tough stainless steel trim tabs and turning fins on both sides. There is also a drain plug on the back of the hull for letting any out water that accumulates inside the hull. Inside the hull to the right is the rudder servo and receiver while the battery is on the left hand side. The motor is right in the middle of the hull about 2/3 of the way of back with the ESC mounted in front of that. 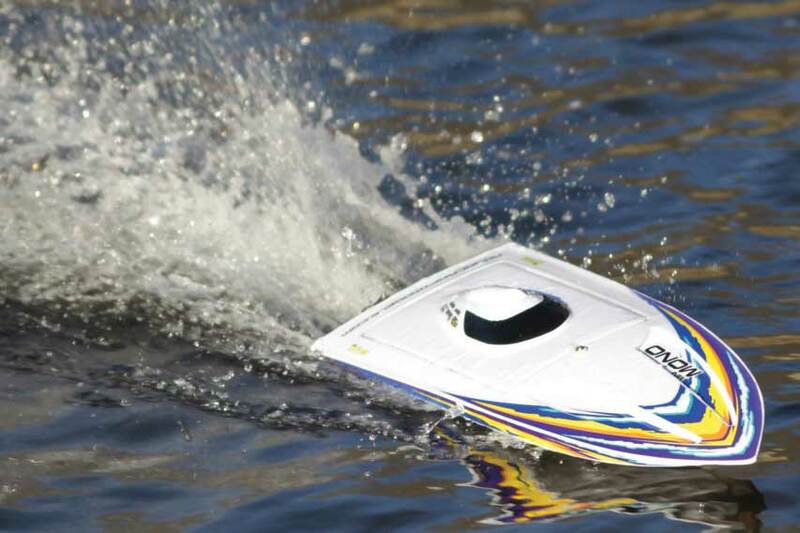 Perhaps the quickest boat in the bunch, the Deep Blue 420 Race Boat can go nearly 30mph because LRP equipped it with a water cooled 2900Kv outrunner brushless motor that connects to the 2-blade composite prop via a flex shaft. The 30-amp ESC is also water cooled and in true LRP fashion it is as smooth as can be. A basic 2.4GHz pistol grip radio is included and offers steering and throttle trim and steering dual rate. Should you pick up the Deep Blue 420 Race Boat from LRP be sure to grab a compatible battery pack (and charger) as it is not included. LRP suggests a battery that is at least 30C, 3S, 11.1V 1800mAh. 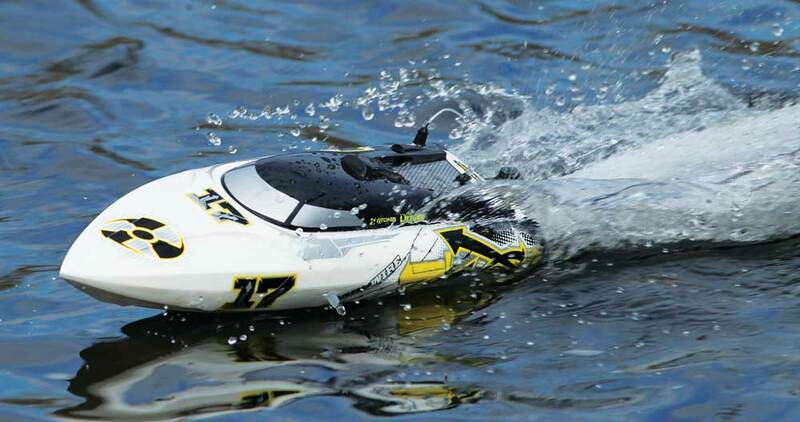 At about 18 inches long, the Minimono is able to quickly cut across the water because AquaCraft equipped it with a speedy 2200Kv outrunner type brushless motor that is water cooled. That motor connects to a 20-amp brushless electronic speed control that is 3S, 11.1V LiPo compatible. To let the user know that the battery is running low it features a stutter bump low voltage alarm so you can get the boat back to shore before the low voltage cut-off kicks in. A 2.4GHz Tactic radio and receiver provides crisp control and has basic trim adjustments. Indide the hull a tiny rudder servo is located toward the left rear while the Tactic receiver is kept safe inside a balloon it to the right. The horizontally mounted battery (sold separately) is secured in place with Velcro in front of the servo and receiver. While the motor may look like it is mounted dead center of the hull it is actually offset ever so slightly to the right to compensate for the torque generated by the motor. Running gear includes a 30mm fiberglass reinforced plastic prop, 1-piece alloy trim tabs and tuning fins, and a breakaway style plastic rudder that is off set to the right. The great thing about a breakaway rudder is that if it hits something in shallow water it will not really break, rather, the O-rings that hold it in place will give way and then be put back into the proper position. If you decide the Minimono is the boat for you you’ll need to grab a 3S, 11.1V LiPo battery pack that is at least 1000mAh in capacity to power the motor and ESC and 4 “AA” batteries for the Tactic transmitter. The ideal starter and backyard pool boat, the Tempo 17” hits speeds of about 18 – 20mph as it is powered by a brushed 390sized motor that utilizes a coil style water cooling jacket to keep motor temperatures under control. It is powered by a 2S, 1500mAh LiIon battery pack that will provide six to eight minutes of runtime and is recharged by any USB port with the included cable. To let the user know when the battery is running low, when there is about a minute or so of battery life left the transmitter will start to beep so you are not stranded far from shore. The included 2.4GHz transmitter has a range of about 150 meters with basic trim adjustments. 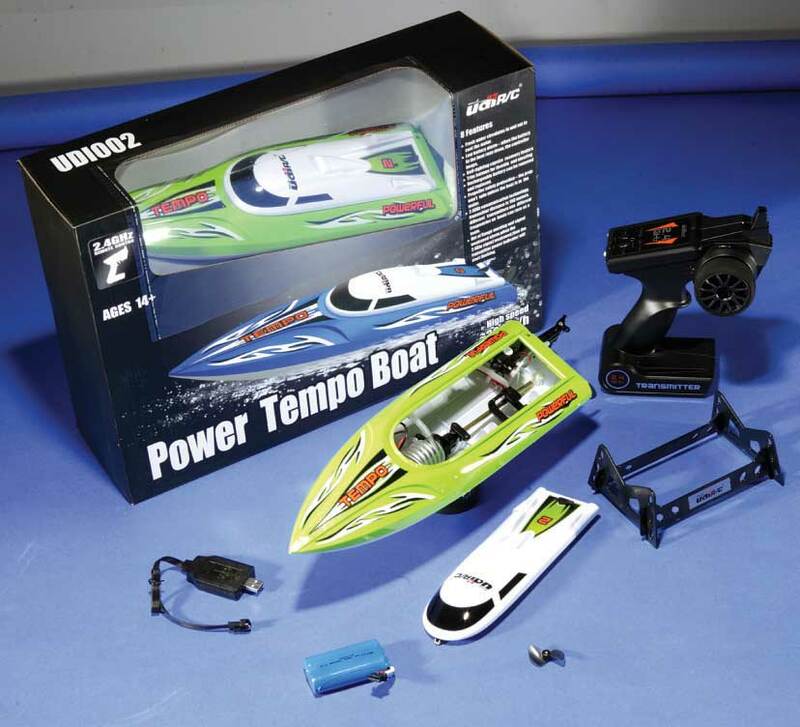 The nicely detailed two-piece ABS plastic hull on the Tempo 17” is designed to be self-righting so should it flip, a quick pull of the throttle will set it right. Inside the hull the rudder servo is located to the back right with the 2S LiIon battery pack to the back left. The 390-sized motor is in the centerline as are the brushed ESC and receiver. The rudder is offset to the right while trim tabs and tuning fins help the hull cut through rougher water with ease. The prop on the Tempo 17” will only spin if the boat is in the water, a very cool safety feature indeed! When on dry land the Tempo can easily be displayed with the included stand. Another speedster on the list is the Barbwire 17” from the people over at Atomik RC. The white ABS deep-V hull on the Barbwire 17” is selfrighting so drive it as hard as you want far from shore without fear because if it happens to go belly-up a hard grab of the throttle will set it right so the fun can continue all day long. 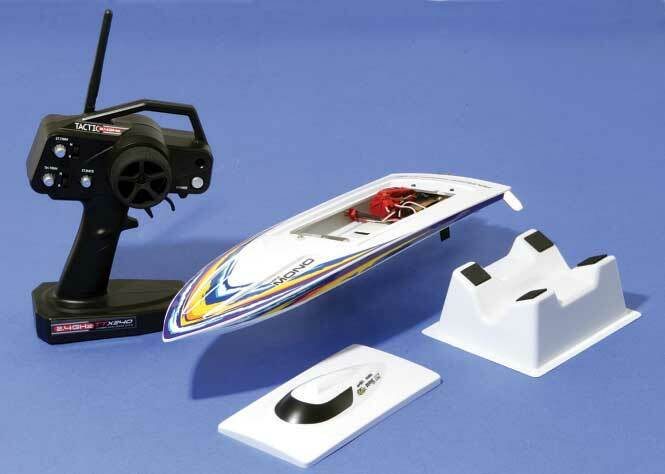 It has adjustable trim tabs and a pair of trim ﬁ ns so it can be tuned to whatever water conditions you happen upon. The aluminum rudder is off set to the right and connects to a speedy little servo that helps the Barbwire 17” zip to the left and right. The electronics package is outstanding to say the least. There is a 20amp water cooled ESC that utilizes a high current EC3 battery connector. On the other end of the connector is a 20C, 3S, 11.1V LiPo battery pack that is charged by the included balancing wall charger that takes about 45 munites to get the pack to full capacity. 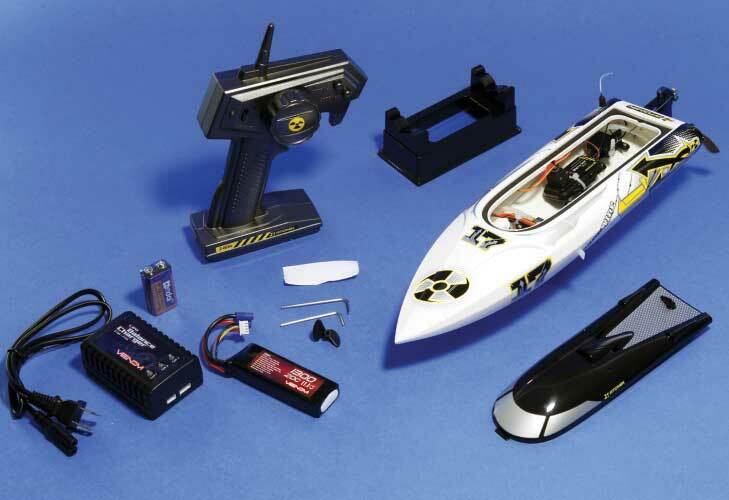 The 2.4GHz transmitter has basic throttle and steering trim adjustments and is paired with a 4-channel receiver that is securely zip tied in place. As for the motor, it is outstanding! Atomik went with a water cooled 2950Kv outrunner motor that has some serious rip. Power is ultimately transferred to a 2-blade composite prop. Should the prop endure any damage from debris in the water don’t fret. Atomik included a spare prop and the necessary hex keys to make a quick change. When you are not using the Barbwire 17” it can be easily displayed for all to see with the included small black plastic stand.